Hello! Welcome to my website and take a good look around. I’m pleased to introduce myself as Alicia M Kaye, a thirty something writer, dreamer and a lover of books. 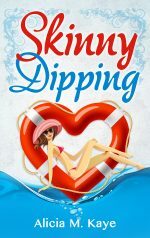 My novels Skinny Dipping and Skinny Cappuccino are self published and are found on most ebook platforms: Kindle, Apple, Kobo. My most recent title, Phoebe’s Performance is also available from Wattpad, where The Martian by Andy Weir began. It’s an exciting time to be a writer: anyone can get some exposure, anything can happen. My passion is writing (obviously). Initially I wasn’t into writing but acting out stories – maybe that was because I was too young to write! I continue to write on a daily basis and the results are found in my books. I truly hope you enjoy reading them as much as I loved writing them.